The HPH family of high-performance hazardous emergency lighting equipment is designed for hazardous, damp and wet locations. Approved for use in Class I Division 2, Groups A, B, C and D, Class II Division 2 Groups F and G & Class III locations, NEMA-4X rated. 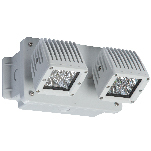 The HPH remote lighting fixture uses 15W high-efficiency LED lamp heads, providing 1300 total lumens.